Along with General Treatments, some of our most common consultations are for Biomechanical Assessments, Orthotics, and Ingrown Toenails. Of course, at Ettalong Beach we treat a wide variety of conditions related to your legs and feet. 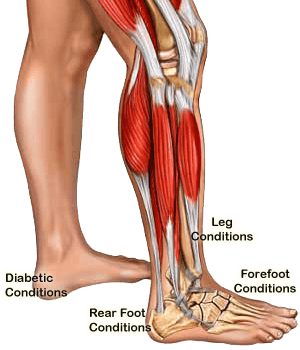 Click the area on the image below that corresponds to the location of your pain or condition to see information about common conditions that affect that area.